Inside Out. A solo exhibition by Hiroki Tashiro at the Yukari Art Contemporary Gallery in Tokyo, Japan from 29th May – June 26th, 2010. YUKARI ART CONTEMPORARY is pleased to announce a solo exhibition by Hiroki TASHIRO ‘Inside Out’ from May 29 to June 26, 2010. 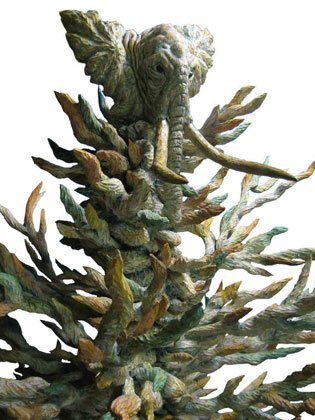 Tashiro specializes in traditional sculpture methods, making wood carvings and applying color to their surface. His work consists of boldly conceived animal figures with a strong sense of dynamism and vitality. His works evoke “changes in spirit and sensation” and express a new composite perspective on beauty experienced through the passing of time and a futuristic sensation that is constantly in flux. This entry was posted in EXHIBITIONS and tagged Hiroki Tashiro, Yukari Art Contemporary Gallery. Bookmark the permalink.